As the cooler weather starts to set in, I'm predicting one item that will gain increasing traction in many a Fall wardrobe is the new crew sweater. Part sweater/part sweatshirt and all sorts of comfy, the new crew can be layered to create a variety of different looks and add a little more personality to a basic outfit. Obtaining such a versatile piece of clothing, however, doesn't mean you have to break the bank. 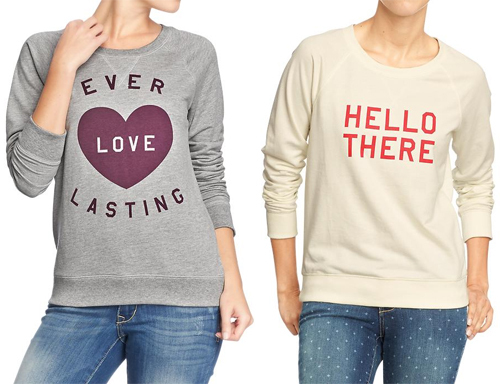 Whether you prefer embellishments, stripes, or witty sayings, Old Navy has managed to create a statement new crew sweater for everyone. Lucky for me, all Old Navy sweaters are now on sale until September 11 with prices starting at just $15. Time to stock up! Love these - especially the red striped one! That's one of my favourites too. So cute! I love sweaters with witty sayings! The nerdier the better! I love that red and white stripey jumper! I am such a sucker for stripes :) We have just started following your blog and love it! Maybe you would like to check us out and follow back?